When I meet a couple at their engagement session I learn about them - and how they feel about each other - just by watching them interact with one another. I absolutely LOVE this part of my job! When I met Tobie and Chad in November of 2017, I could instantly tell how they felt about one another. They genuinely love each other on a deep level. They have the type of love that is full of compassion, support, respect, and encouragement. When I asked Tobie to tell me their "story," she explained this very type of love. Tobie and Chad met unexpectedly in July of 2014. Tobie was a single mother of eight month old twins, a full time college student, and she also worked part time. One day her storage building was vandalized and had her belongings stolen. During this time, Chad was an investigator for the county. Any guesses how Chad and Tobie met?? You're right! He picked up Tobie's case! He worked really hard to recover her belongings. Even after most of her belongings were recovered and the case was closed, Chad continued to text Tobie. She was focused on her twins and school at this time in her life so she had to blow Chad off several times. However, Chad was not going to give up on Tobie. He continued to reach out to Tobie and after a month, they finally decided to go on a date to the Prairie Hill Drag Races. They had an amazing first date and were inseparable from that time forward. Maybe it was love at first sight? Fate? Call it what you want, but they were meant to find each other. After six short months Chad decided to apply for the DPS Academy and Tobie applied for the OTA school. They knew that realistically only one of them would be chosen to advance their careers at this time since only one thousand applicants are chosen for the DPS Academy and only two hundred applicants are chosen for OTA school. Any guesses who was chosen?? Before Chad left to the academy, he purchased a home for them, even though he would not be living there while he was at the academy. About one year later, Chad graduated the academy with Tobie in the audience supporting him. Earlier that day she took her first final in the OTA program and drove straight to Austin to watch Chad graduate. After graduation from the academy, Chad was stationed in Corpus Christi for a year and a half. Tobie and the kids saw him once a month. Tobie says that their relationship had never been so strong. They never doubted their future together even though it was difficult living apart. In April of 2017 Chad was stationed in Limestone County and Tobie graduated one month later in May. They purchased their dream home soon after and have plenty of room for their cattle, which is a big part of Chad's family. 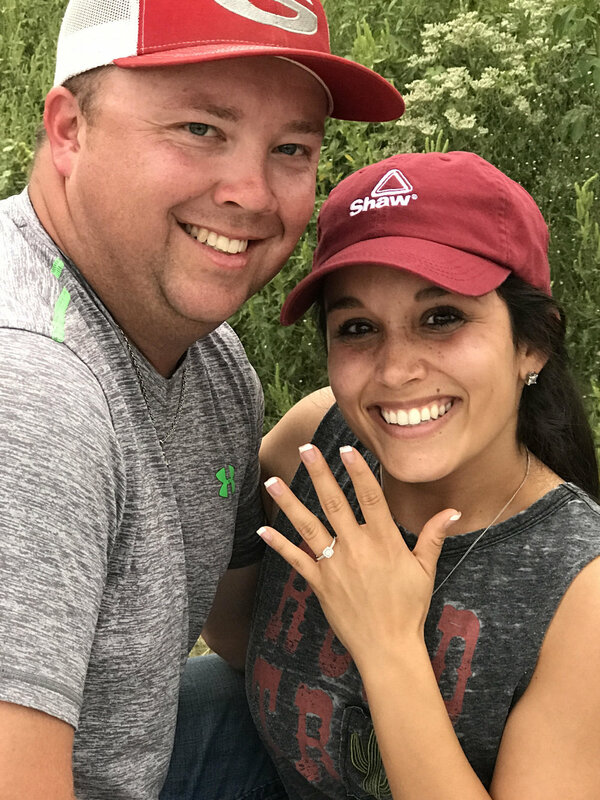 Chad popped FINALLY popped the question in September of 2017 on a family outing. They loaded up the truck and went to the river on Chad's grandparent's land. Tobie and Chad sat on the tailgate as they watched the alligator gar with the noise of the kids playing in the background. Tobie was taking photos of the kids as they were playing. During this time Chad says, "Let daddy take picture with y'all," and told Tobie to turn around and count to three before she turned around to take his photo with the kids. When she turned around, Chad was on one knee with the kids posing behind him. Tobie caught the exact moment! It was far from what most people would consider perfect, but it was better than Tobie could have ever imagined. They were at their special spot with their three most prized possessions. Tobie told me that they are "far from perfect, but God blessed the broken road." She explained how they have had to endure several struggles to become what they are today. They appreciate one another because they know what it's like to not be appreciated. Together they make a family...a whole family. They have kept the Lord their number one throughout all their trials and tribulations and thank him every single day for their life together. Chad and Tobie are engaged!